On June 13, 2018, Sheriff’s Special Investigations Bureau (SIB) Detectives concluded an investigation into 30-year-old Dylan Sulit-Swalley who was believed to be selling controlled substances in Santa Barbara. Sulit-Swalley was released from Pelican Bay State Prison in 2017 and placed on parole. At approximately 3:00 p.m. yesterday, June 13, Sulit-Swalley was contacted in the 300 block of Cabrillo St. in Downtown Santa Barbara. He was detained and a parole search was conducted on his vehicle. During the search of his vehicle he was found to be in possession of heroin, Xanax, suboxone and drug paraphernalia. Sulit-Swalley was taken into custody for the violations of 11350(a) H&S- Possession of a heroin and Xanax, 11375(b)(2) H&S- Possession of RX medications and 11364 H&S- Possession of drug paraphernalia. Detectives later executed a parole search at Sulit-Swalley’s residence located in the 3800 block of Cinco Amigos in Santa Barbara. 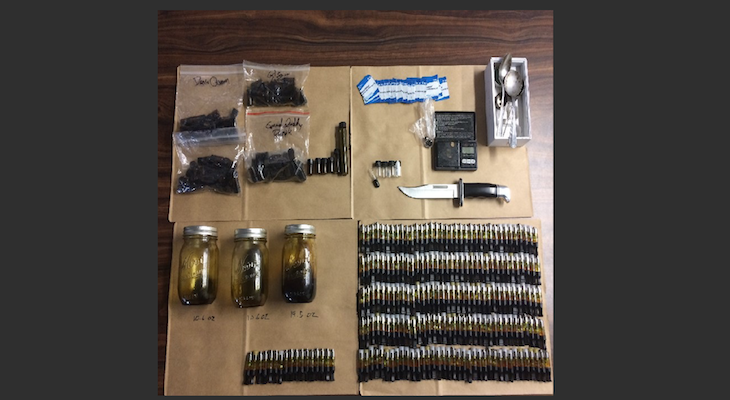 During t he search, detectives located three mason jars containing approximately 35.7 oz of concentrated cannabis or Butane Honey Oil, 13.7 oz of Butane Honey Oil packaged for sale in 5 gram vials and over 200 Butane Honey Oil vape pen caps packaged for sale. Sulit-Swalley was then arrested for the violation of 11359 H&S- Possession of concentrated cannabis for sale. Detectives later discovered Sulit-Swalley was currently out on bail for 459 PC, Burglary. 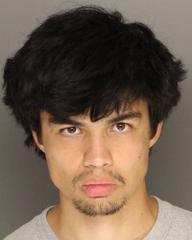 Sulit-Swalley was booked into the Santa Barbara County Jail on the above stated violation and a 3056 PC- Parole hold. He is being held without bail. You would think so localmatt. The reality is that it is easy for prisoners to get or stay addicted in prison. What Freediver is saying makes sense. There needs to be a better solution than to throw an addict into a system where he stays addicted. How could he be out on bail for a burglary while on parole from state prison? Once he was arrested shouldn't he have been immediately sent back to prison? This guy is bad news but law enforcement needs to pick up their game. If you have enough money it is easy to "slip through the cracks" of our bloated, unjust, inept, and money-hungry criminal justice system. It is not "nearly impossible" to keep people incarcerated, witness the over 220,000 currently incarcerated in California. Of course they get out eventually. It costs about $75K a year to hold them. The prison guards and prison construction lobby don't like to let inmates go but the rest of us are better for it. Law enforcement does not determine bail or sentencing. That would be up to the courts. Recent laws passed make it near-impossible to keep people incarcerated anymore. This is why this guy, and many others, are walking our streets and leaving havoc and ruined lives in their wake.